By many measures, China is one of the biggest commercial shipping powers in the world. Propelled by the twin needs of importing much of its raw materials and exporting much of the world’s consumer goods, Chinese companies own the third largest commercial fleet in the world, behind shipowners in Greece and Japan; China’s shipyards built one-third of the world’s commercial fleet in 2017; and its container ports account for over one-quarter of the worldwide capacity. The furtherance of that sea reach is a major part of the “Belt-and-Road Initiative”, a multi-billion dollar, Chinese-financed project to build roads, marine terminals and other transportation infrastructure throughout Asia, Africa, and Europe. The BRI aims to connect China with a market comprised of two-thirds of the world’s population and nearly half of its gross domestic product. China already has a toehold in Italy as Cosco Shipping Ports (HKEX: 1199), one of the world’s largest terminal operators, is developing Italy’s first automated container terminal at the Vado Port in Liguria. The BRI deal expands that reach. As part of the new agreement, China Communications Construction (HKEX: 1800) will help Italy’s largest port, Genoa, in construction and modernization projects. China Communications Construction also struck a deal to improve rail infrastructure with the port of Trieste, which is a major gateway for delivering goods to Europe’s landlocked countries. Italy is only one part of China’s stake in Europe, its second largest trading partner behind the United States. Cosco Shipping Ports also runs two of the three container ship docks at Piraeus, the biggest port in Greece. Along with stakes in terminals in Germany, Belgium and the Netherlands, Chinese firms own about 10 percent of the container capacity at European ports. 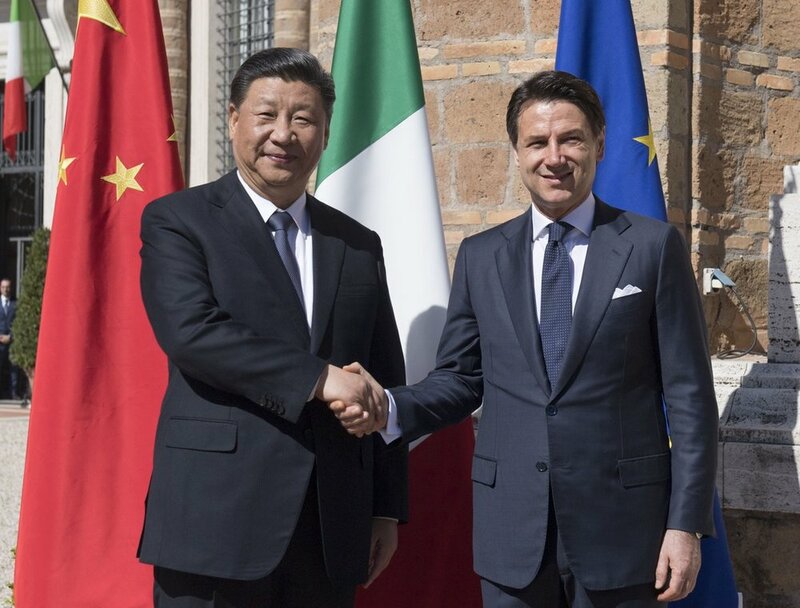 Beyond port-specific deals, China’s wider agreement with Italy covering both maritime and surface transportation is a coup for the BRI, which has largely targeted developing countries in the Asian subcontinent. Now the project has the endorsement of the third largest economy in the European Union. While its ostensible intent is the advancement of trade, the BRI is also perceived as giant debt trap due to the onerous loans, chiefly from Chinese banks, that some participants have been saddled with to fund the projects. Moreover, China has also used the BRI to further its national interests. Three Chinese warships sailed into Piraeus in 2017 to conduct naval exercises with Greece’s navy as part of a BRI summit. Along with hosting China’s navy, the Piraeus port has been named as a site for potential tax evasion by shippers seeking to avoid paying customs and other duties on imports into Europe. Italy is a major global economy and great investment destination. No need for Italian government to lend legitimacy to China’s infrastructure vanity project. FreightWaves Jim Wilson reports on the after-effects of Cyclone Veronica, which blew over the northwest coast of Australia. He writes that operations at the world’s largest dry bulk ports appear to be largely, although not completely, unscathed. Nevertheless, rates for dry bulk vessels remain in a slump. According to official statements from the Pilbara Ports Authority, which operates several ports along the Pilbara coast, the ports of Dampier (the world’s second biggest iron ore export port and some salt) and Ashburton (LNG) are open. The world’s biggest iron ore export port, Hedland, is still shut according to a statement on the port’s website. However, that is slightly contradicted by a separate statement from the Authority that Hedland was only shut for Veronica’s duration four days, which does tend to imply that the port has, in fact, resumed operations. Meanwhile, FreightWaves has heard from sources that shipping has been scheduled to take place at Hedland. Furthermore, there is a statement from junior mining company, Fortescue (ASX: FMAG), which says that the Authority reopened the port. In an official statement, the Authority said that damage to infrastructure was minimal and that there was no significant damage at any of the ports. A notice to mariners reveals that three navigational aids have been damaged at Port Hedland and repairs are underway. According to the Authority, the total shutdown at Hedland lasted about four days; Dampier closed just over five days; and Ashburton was also closed close to five days. Pilbara Ports Authority CEO Roger Johnston said the safety of staff and port users during the cyclone was the main priority. “Our staff live in the communities that were impacted by the cyclone, so their safety was paramount to us, along with the safety of everyone across our sites. This was a very severe weather event and I would like to acknowledge staff and port users for their professionalism and hard work during this challenging time,” Mr Johnston said. The Authority envisages a return to normality by early Thursday. Major mining company BHP (NYSE: BHP) did not respond to questions. Rival miner Rio Tinto (NYSE: RIO) also ignored questions and instead released a short statement that normal operations will resume “once it is safe to do so”. Meanwhile, mining company Fortescue said that iron ore shipments resumed from Hedland on the afternoon of Tuesday, March 26. Fortescue added that its rail operations were suspended on Saturday, March 23, but these have now resumed after localized-flooding subsided. The mining company adds that shipping has begun using inventory at the port and that there are sufficient ore stocks at Hedland for operations to resume. Presumably, it can be inferred that, despite the heavy storm surges and extensive rainfall, that the iron ore stockpiles are not so wet that they cannot be transported. Nothing is known about the current status of the salt stockpiles or salt pans as Rio Tinto, which owns those commodities, is not providing any information. Maritime executives familiar with the situation on the north west coast have commented that congestion levels at the north west bulk ports will blow out from a pre-storm average of about two days to five days while shippers and ports work through the backlog. Turning to the dry bulk markets and one source told FreightWaves that the market for capesize vessels, which carry most of the world’s iron ore, on the Hedland-Australia to Qingdao-China route have been adversely affected. “There seems to be flooding at mine sines. We’re trying to find out which ones. There has been a little bit of damage at Port Hedland and some flooding in the stockpile areas,” the executive commented. Capesize freight rates are trending down but all of the other sizes of vessels have shown “good recovery” over the last week. Capesizes were generating an average freight rate of US$4,035 per day. But the smaller kamsarmax vessels are generating rates of $10,100 per day and even smaller panamax vessels are generating about$8,313 per day. They’re interesting figures. They’re interesting because capesizes are generating lower daily freight rates than the other sizes of vessels. Historically, and as previously reported on FreightWaves, that’s been a marker that a downturn in capesize market may be about to end. The reason is that dry bulk vessels are, to some extent, partially interchangeable (depending on many factors, especially depth and length restrictions at a port). In theory, the kamsarmax and panamax vessels could potentially handle a cargo normally carried by the smaller capesize vessels. Similarly, the smaller capesizes could potentially carry a cargo normally transported by the bigger kamsarmax and panamax, provided it can physically fit in access channels, berth pockets and canals at the loading and destination ports. Normally, that would be uneconomic. However, freight rates sometimes make the impossible, possible. With capesize rates being less than half of both kamsarmax and panamax rates, it’s possible that capesizes could grab cargo that would otherwise be carried by the other two categories of vessels. However, some maritime executives draw a completely different inference. “Over the last five years, capesizes have been decoupling from other size vessels. Capes are more and more focused on carrying iron ore. About 78 percent of all capesize cargoes is iron ore. The rest of the cargoes are coal and a bit of salt. Why? Chinese demand. The markets for the other size vessels is much more fragmented,” the source says.